Instead of going out and causing mayhem on (and yes, I had to search to find out some of these names) Mat Night, Devil’s Night, Mischief Night, Gate Night, Cabbage Night (really? ), Goosey Night (really really? ), or whatever you may call the night before Halloween, why not stay in and enjoy a night of Val Lewton produced horror and suspense? As part of its Halloween programming the Turner Classic Movies channel is devoting their Friday night schedule to the RKO films produced by Val Lewton, the man responsible for, well, the films you see here. So here is just a quick listing of show times, with very beautiful movie poster art (especially, at least for me, the Isle of the Dead art). The night of shadows starts of at 8 PM with Jacques Tourneur’s Cat People (1942) starring Simone Simon and Tom Conway. 11 PM brings satanists and The Seventh Victim (1943) starring Tom Conway and Kim Hunter, directed by Mark Robson. At 12:15 AM Director Jacques Tourneur returns with a murderous escaped circus leopard in The Leopard Man (1943). Richard Dix is the sadistic captain of The Ghost Ship (1943) at 1:30 AM, directed by Mark Robson. At 2:45 AM Boris Karloff is The Body Snatcher from 1945, with Bela Lugosi and directed by Robert Wise (The Haunting, Day the Earth Stood Still, Andromeda Strain, and many, many more, both as director and editor). 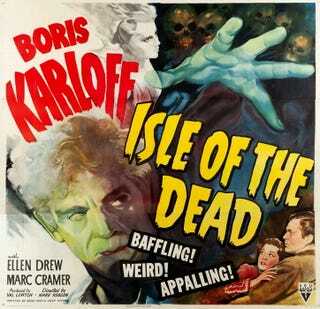 At 4:15 AM Boris Karloff returns to fight a plague in Isle of the Dead (1945), directed by Mark Robson. The Val Lewton retrospective concludes with 1946’s Bedlam, airing at 5:30 AM, the last movie in the unrelated trilogy starring Mr. Karloff and again directed by Mr. Robson.